I briefly forgot about this game after the Cards and Reds had their little dust up in the first inning. I think those fireworks have ended, so I’ll settle for Yahoo updates. Brandon Phillips is 0/7 in the series. Just sayin’. Right now, the US is 0-0 with Brazil….now it’s 1-0 Brazil. Perfect timing for them. Anyway, we’re kind of sending out our World Cup team one final time before we turn our eyes toward 2014. Brazil is fielding a young side, but as with all Brazilian sides, they’re very, very skilled. I didn’t get to this before the Cup started and I’m barely making it here since Uruguay-South Korea has already started. Unfortunately (or perhaps fortunately for our intents and purposes) the game is frozen with the Koreans about to take a free kick in the 4th minute. Anyway, it’s time for some predictions because everyone loves them even if none of them are right. With today’s 2-1 defeat at the hands of South Africa, France’s dismal World Cup run has come to an end. The only reason this makes me sad is because of the insane drama they brought to this year’s edition of the World Cup. Sending home a star striker? Refusing to train the next day? Having the head director of team quit and fly home early? Having the President of the country call the team out publicly? Yeah, that’s drama. But first let’s start at the beginning. The French team struggled through qualifying, finishing second in UEFA Group 7 to Serbia. Then, they only secured a qualification through Thierry Henry’s double handball during the playoff against the Republic of Ireland. My plan today was to DVR the USA-Slovenia match, avoid all forms of media, and then watch it when I got home after the game. That idea went out the window when the game was on the scoreboard at Busch Stadium while I worked with a young baseball team. There was no audio and it was hard to follow, but I got to watch it nonetheless. I’m about to watch the replay so I can get a better idea of what went down but I’m still going to write a post about the game. The first thing that I want to mention is the horrid marking that occurred Slovenia’s first goal. Valter Birsa had days to line up his fantastic strike from just outside the penalty area. Michael Bradley had stepped up to take away the initial ball carrier when he laid it off to Birsa. From there, I don’t know where Jose Torres was and I don’t know why Oguchi Onyewu didn’t step up and at least act like he was putting pressure on the ball. Birsa punished them for their terrible marking. We’re five days into the universe’s biggest sports event and that means there has been plenty of stuff to talk about. Unfortunately, I spent all weekend moving to St. Louis so I haven’t had time to write here. Instead of going through each team that has already played, I’m going to try and hit the highlights and low lights from the first few days. The first thing I feel like I have to mention is the presence of the vuvuzelas in the stands that people all seem to hate. Honestly, I don’t even notice them. I want someone to bring me one so if you’re reading this and can get one of these horns to me, send me an email at wellerandbryan@gmail.com. I had every intention of writing a fairly in depth preview of the USA-England match that happened today but I’m in the middle of moving to a new apartment and that’s not conducive to posting. I don’t know what Weller’s excuse is. USA needs to attack the wings. USA needs to neutralize Rooney. USA needs to shoot the ball any time their inside the midline. USA needs to play out of their minds. 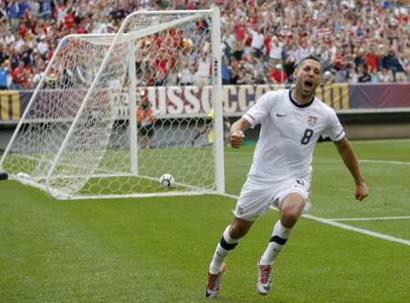 Clint Dempsey celebrates his game winning goal. In a game that showcased a team that we’re much more likely to see in South Africa, the United States beat Turkey 2-1 in Philadelphia. Two days ago I outlined the team that I wanted to see take the field today. As it turns out, that was very close to the team we saw this afternoon. Bob Bradley’s decision not to start Oguchi Onyewu in favor of Clarence Goodson was probably due to the lingering affects of knee surgery, but Onyewu saw significant minutes in the second half. The one move that surprised me was Benny Feilhaber getting the start at one of the outside mid spots opposite of Landon Donovan. It looked as if that decision would backfire immediately as Feilhaber made a terrible cross field pass right to the feet of a Turkish player who thankfully pushed the ball wide. From there, he failed to make a serious impact before being taken off after halftime. I think Jose Torres may have swiped his spot with his inspired second half play. But more on that in a bit.